Constantius was the middle of the three sons Constantine had with Fausta. Of the three he was the one that showed the most promise. But like his brothers he was brought up as a royal surrounded by flatterers and subordinates. Where Constantine himself had needed to get a good grip on the realities of human nature simply to survive growing up in the court of Diocletian, the princes of the blood had no such education. But Constantius was lucky in one way in that he was sent at an early age to the East where conflict with the Persians was probably already underway. It may well have been this early grounding in the reality of war that made him relatively speaking the most successful of the sons of Constantine. He managed to rule reasonably effectively for twenty four years, died a natural death and had some successes. His reign did very nearly end in the chaos of a civil war, but on the whole he seems to have done okay although he never really got a grip on the empire in the way his father did. Lets look at the situation with the Persians where Constantius cut his teeth as Caesar. He was officially appointed to that post at the age of 6 but seems to have been actively involved in the campaign on the borders at the age of 20 when his father died. While Constantine was still alive and running a strong and united empire, the Persians had little hope of making any impression on the Romans. They had fewer resources and could only make progress if the Romans were disorganised or distracted. During the reign of Constantine, the balance of power was so much in favour of the Romans that the Persians basically kept their heads down. The death of the long serving Tiridates of Armenia might have encouraged them to have a go. 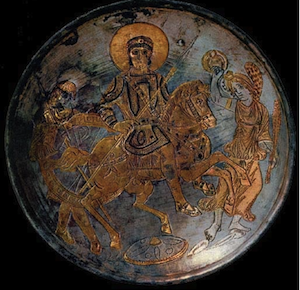 My reading of the situation is that Constantine had Armenia pretty firmly within the sphere of influence of Rome all the time Tiridates was on the throne, and he was on the throne a very long time (385-330). When he died the Persians tried to turn the situation more to their advantage. Constantine’s response was to use force to restore the status quo. This was bad news on paper for the Persians, but they did have the advantage of having a highly effective monarch in the shape of Sapor. Sapor like Tiridates and Constantine had had an exceptionally long reign. But unlike them he was still young and vigorous. This was because he had got off to a very early thanks to the rather remarkable distinction of having been crowned before he was born. The Persians had the same problems picking chief executives that the Romans did, and he had happened to be conceived during a particularly troublesome patch of dynastic history and there was a pressing need to get a monarch in place to prevent a civil war. Previous peace settlements had left the Romans in a strong position with an easy to defend border. Being Romans they had used their engineering skills and had improved their defensive position still further by the creation of some powerful fortresses and walled cities. So the Persians were faced with a powerful potential enemy who could attack at will but who would in turn be hard to attack. The Persians had a strong motive for trying to push the Romans back. What is less clear is the precise chronology of the conflict. If you were in Sapor’s shoes you might well calculate that waiting for the death of Constantine and then pouncing quickly before the new regime was established would be a good plan. But the sources seem to indicate that war had already broken out when Constantine died. Gibbon at this point becomes uncharacteristically ambiguous. I have a feeling that for once he couldn’t actually get a consistent narrative thread out of his sources. He was the first historian to make use of Armenian sources and they may have been difficult to interpret. But while it is a bit vague when things happened, what actually happened is a lot clearer. And what happened makes a lot of sense when you consider the relative positions of the two empires. The Romans were motivated to maintain the status quo. This was just one of their borders and one that they were pretty happy with, and they had bigger threats on the Danube and the Rhine to worry about. The Persians by contrast needed to hit hard and quickly to have any chance of making any impression. There were seven pitched battles all won by the Persians. This must have embarrassed the Romans. But sieges of the fortresses by the Persians were unsuccessful. The key one was Nisibis, which the Persians laid siege to three times. In the third siege Sapor ordered a river to be diverted and flooded the plain outside the city, with the level of the water reaching the level of the top of the walls. The Persians then attacked by boat. It was creative, but it didn’t work. So the victories of Sapor were empty because he got no real advantage from them. Nobody enjoys a public humiliation and lack of success in arms could turn into political problems at home, but you have to wonder if the Romans were simply doing the logical thing. Send enough troops to disrupt Sapor’s movements and hamper his logistics. But don’t risk a big force that would be hard to supply and make sure the defensive pinch points are strong enough to withstand any assault. So the events of the war could represent a cool and rational approach by the Roman high command. Or maybe, the succession of defeats was not the result of Sapor’s genius but a clever attempt to discredit Constantius in order to benefit somebody else’s ambition. That may sound a bit byzantine, but we are talking about the Byzantine empire now. But whatever the truth of the matter, when the rebellion of Magnentius in the West broke Constantius was in the East with inadequate forces, a somewhat poor reputation for generalship and worst of all, a live and active enemy to deal with. Magnentius must have been very well aware that it was he that held all the cards. He must have calculated that Constantius had no option but to recognise his fait accompli and acknowledge his position as emperor of the West. That Constantius was not prepared to deal with him must have come as a suprise. When Constantius succeeded in overcoming the admittedly somewhat half hearted rebellion of Vetranio by force of character and not much else, the match was suddenly a lot more even. Magnentius still had more and better troops, but Constantius had legitimacy and had also succeeded in gaining the initiative. The empire now faced the worst case scenario. Thanks to the policies of Constantine there were huge forces available – it is quite probable that this would have marked the highest point of men under arms in its history. And these forces were now divided very roughly in two and were going to fight each other. Magnentius took the initiative. He invaded the territory of Constantius and in early fighting came off best. Both sides sought a large engagement to settle the matter. The big clash came at Mursa where over 100,000 troops were involved. This may not have quite been the largest battle in Roman history in terms of numbers of actual participants but it is the one with the highest recorded death toll. The fighting took place on a level plain. The army of Constantius was in a better position with a river guarding its flank and with a superiority of cavalry. This enabled them to outflank and apparently surround the army of Magnentius. In the days when fighting was hand to hand large numbers of deaths in a single battle are not a common occurrence. But if one side can succeed in trapping the other in a small area they have the option of completely wiping them out. Hannibal succeeded in doing this at Cannae. Uncontrolled panic in retreat was another situation where deaths could be very high. There was an example in the English wars of the Roses at Towton where 28,000 were killed in a single day. The military technology of the pre-modern world was primitive but that didn’t mean that large numbers could not be killed. It is best not to think about the details – the deaths would be both very numerous and very gruesome. I just say all this to point out that the 54,000 killed at Mursa sounds very high and it might be put down to exaggeration. But there is no reason in principle to doubt it. Constantius was not actually leading the troops in battle. He was nearby in a church praying for victory. I like the politics of that. He was effectively sharing the danger since he was signalling his whereabouts. If the day went badly the enemy would certainly find him and kill him. But he showed that he had faith in his generals by letting them handle the actual battle. His prayers were answered with a decisive victory, but it was an extremely costly one. In one day the Romans had lost enough men to form a large army. The borders were going to be short of men for some time to come. Even now Magnentius did not give up – and it took another battle the following year to finish him off finally and leave Constantius as the undisputed ruler of the Roman world. And it was a major operation involving a wide scale of operations in Africa, Italy and Gaul before finally Magnentius paid with his head. Both sides had hired barbarian mercenaries who continued to be a problem after the death of Magnentius, and the frontiers were not guarded properly for a couple of years allowing inroads particularly into Gaul. The revolt of Magnentius was to scar the west for some time yet. We have just got to the end of the eighteenth chapter of this work and although we have seen a lot of declining of political institutions, an economy turning into a train wreck and the establishment of a rigid totalitarian state with an absolute ruler we haven’t yet seen much in the way of decline in the size of the actual empire. The area under the control of Constantius was still larger than it was under Augustus when Gibbon started his story. It had only lost one province since the reign of Hadrian. But things are starting to change on this. Watch out for the mobility of the emperors from now on. The story of Constantius takes us all over the map. He is as likely to turn up in Milan, Rome or on the borders facing the Persians or the Germans. His immediate successor, Julian, likewise will be actively taking part in events in Gaul, Italy and projecting the empire’s power across the border into Persia. But the time is rapidly approaching when the empire will lose its capability to make the running anywhere it chose to deploy its forces. Constantius ruled the empire alone and made a reasonably good fist of it. But it was proving to be a strain for one man. Despotism always put a strain on the despot. The empire was a big thing for one man to handle. Diocletian’s reforms had been swept away by Constantine and he had not left any other model than rule by one man. Even brothers were prepared to fight one another. But that one man could not be everywhere. Delegating is something a lot of us find hard to do successfully, but it was an excruciatingly difficult business in the post-Constantine empire. There were so few people that you could actually trust. Able and ambitious people could turn into another Magnentius. The unambitious and the untalented brought other problems. Family members posed another risk, but Constantius must have decided that they were the best option. Unfortunately most of them had been killed. But there were still a couple of young royals still on two legs – Gallus and Julian. In the next couple of episodes we’ll see how Constantius got on with bringing them onto the main political stage.